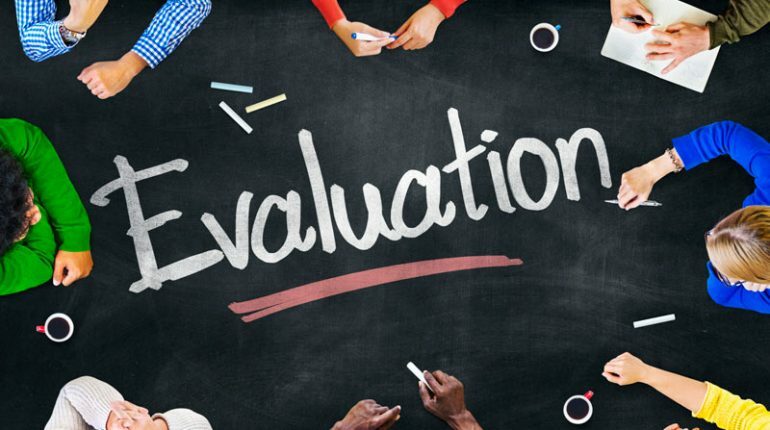 Evaluations are essential to help us improve as speakers; they should be balanced, substantial, and encouraging. Ideally, an evaluation should have neither ‘’white washing’’, nor be overly harsh. Evaluations should aim to have the speaker encouraged to leave the night’s meeting excited to write their next speech, but to have received balanced feedback of proper substance. 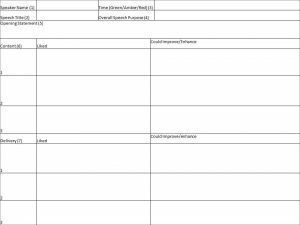 I have limited experience with evaluations, but I have developed a general ‘one size fits all’ approach independent of speech manual objectives which I hope will be helpful. I took part in the evaluation competitions this year as I saw it as an opportunity to practice and improve my evaluations. The result? I placed third in the Scottish finals, so you’re in reasonably good hands as we make our way through this blog! The approach I have taken was constructed by my own initiative, whilst also ‘sponging’ up videos of District 71 finalists and winners, and reading up on various blog spots by District evaluation winners from across the world. Above all else, the primary source of information I cited was the judging ballot sheet (https://www.toastmasters.org/~/media/5a2264b34819485196f752b6940ce14e.ashx), always a good starting point for the budding competitor! Prior to competing I memorise the following table and draw it out. You’re given a blank sheet of paper to write on, as you’re allowed take notes during the contest and use them during the evaluation. Each of the seven components to be found within the table will be explained in more detail. Before I explain the 7 items highlighted there’s one crucial thing to remember: An evaluation is a speech. The very foundation of any speech is structure. In the case of evaluations, the sandwich approach is normally the one taken: (1 Commend; (2 Recommend, and (3 Summarise the commendations and recommendations then end on a commendation. This fits in nicely with the judging criteria, as they expect helpful, balanced, and insightful comments that connect with the speaker and audience alike with a summation at the end. To achieve maximum effect from your evaluation, not using notes will put you at an instant advantage speech structure’s your friend! 1: Remembering the test speaker’s name is basic but very important! The speaker normally will not be revealed until they are called to the stage to give the speech. Take note also as to where the speaker is sitting so you know where they are seated for your evaluation. Easy enough perhaps at club level, but vital when you’re in a large venue like the Scottish Parliament! 2: The speech title; jotting down the speech title will be vital as you can use that throughout your evaluation to reference different points and make some witty remarks. 3: Noting whether the speaker fell into the green/amber/red will have a bearing on your suggestions for improvement, and also add points to your analytical quality. Funnily enough, during competitions when I noted that the speaker fell under time I saw members of the audience let out a small gasp (as if to say, gosh I never thought of that?!). 4: The speech purpose; in Perth we broadly categorise speech purposes into Inspire, Persuade, Inform, and Entertain. Once the purpose of the speech has been defined, coupled with your experience of these speech types, should already set out criteria in your mind as to what you want to see in this speech and what can be done to improve it. Experience with giving speech projects from the advanced manuals that delve into the theory behind speeches of a particular purpose will be of an advantage. 5: An opening statement should have a personable touch that addresses the contest chair, the audience, and individually refer to the speaker in order to make a connection (note point 1 above!). This also refers back to the previous point about striving not to use notes and remembering that an evaluation is like speech, not only in terms of structure, but also to have a strong opening. If an opening remark during the initial greeting can refer back to something in the speech or open on a humourous, yet encouraging remark that’s always a good way to open up! It’s also important to highlight how you’re going to conduct your evaluation and introduce the structure (i.e. Concerning the delivery and content, I’m going to talk about what I liked and what can be improved in the hope that I can offer Mickey Mouse something substantial as he leaves here this afternoon). 6+7: Three main points about the delivery and content; too often have I seen evaluations run over time because the evaluator has not prioritised the main points, and then to further create a disconnect with the speaker and audience as they try to read their own hand writing! Three points concerning both delivery and content should suffice, and again introduces three phase structure that sits in the memory and hopefully can help you get off the notes. At the end don’t forget a one-two sentence summary of the main points you liked, and what you think can improve with the aim to finally encourage the speaker. Evaluate to motivate and all that jazz! Part of the Toastmasters International organisation, dedicated to developing communication and leadership skills. We are not for profit and run by the members for the members. Membership fees of £102 per year cover the costs of the venue and sundry club expenses.